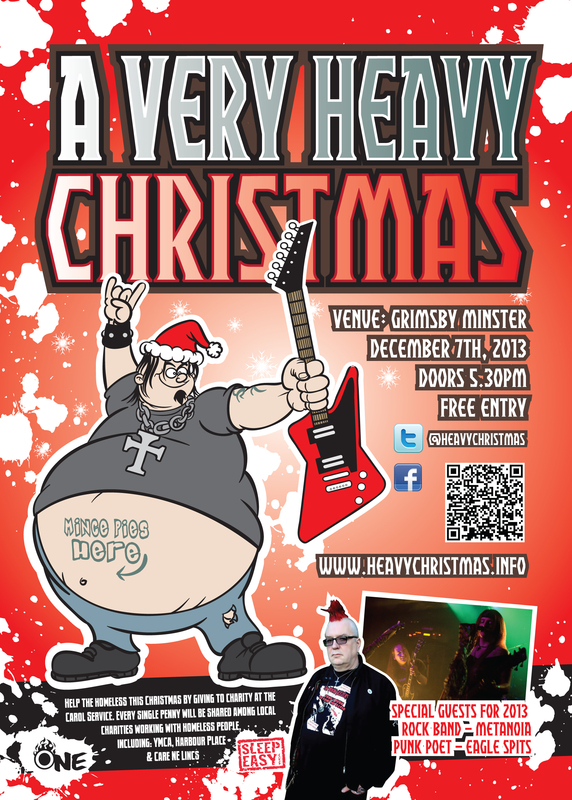 Back for its third year, the world’s first official HEAVY METAL CAROL SERVICE. With only a week left to go until A Very Heavy Christmas 2013, we’re delighted to be able to confirm our line up for the UK’s only official Heavy Metal Carol Service. Joining us for the night will be Vicky Frost, a talented singer who will be doing a very atmospheric solo carol to start the service. Also on the bill are Grimsby based purveyors of bluesy psychedelia Seaside Johnson, punk poet Eagle Spits, a local un-named ‘supergroup’ of top musicians, and visitors from the distant land of ‘Yorkshire’ (where ever that is): hairy rockers Metanoia. And we’ll have a couple of other delights to share with you too – it looks set to be our best carol service yet. Metanoia’s Robb Sutherland brings some hair to proceedings. Entry is free as always, if you are able to leave a donation to the work of local charities who work with homeless people – then that would be welcome. Last year’s Carol Service featured on the BBC World Service no less, and we expect the word to spread far and wide this year too – so get ready to headbang merrily on high, as we wish you all a very heavy Christmas.